The theme of Huawei’s press conference atop One World Trade last week was clear: The company plans to make its mark in the U.S. The hardware maker has made a name for itself outside the States with a string of high-quality handsets, but, as with a number of Chinese companies, this country has thus far proven a tough nut to crack. 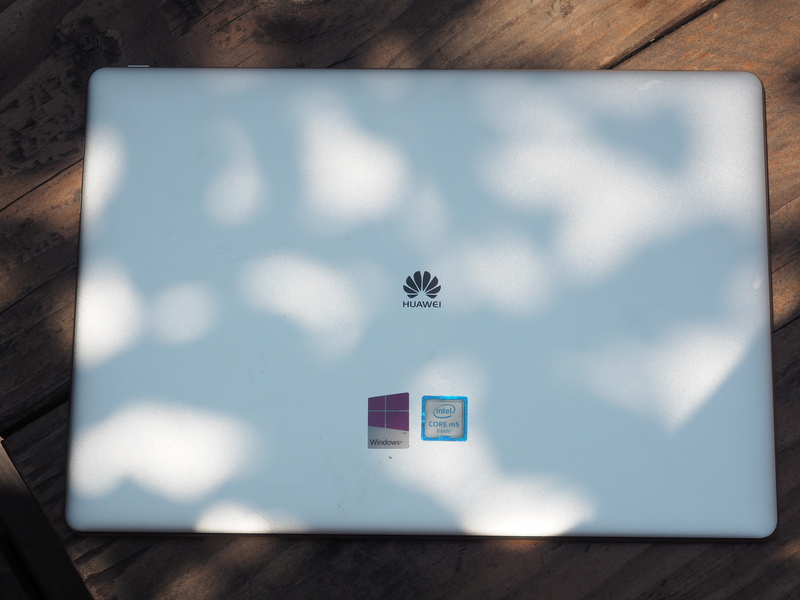 Announced at Mobile World Congress earlier this year, Huawei clearly believes the MateBook might be the device to do just that. A premium tablet coupled with some key (if flawed) accessories, the two-in-one looks to bring Apple’s eye for hardware to the Windows 10 ecosystem. 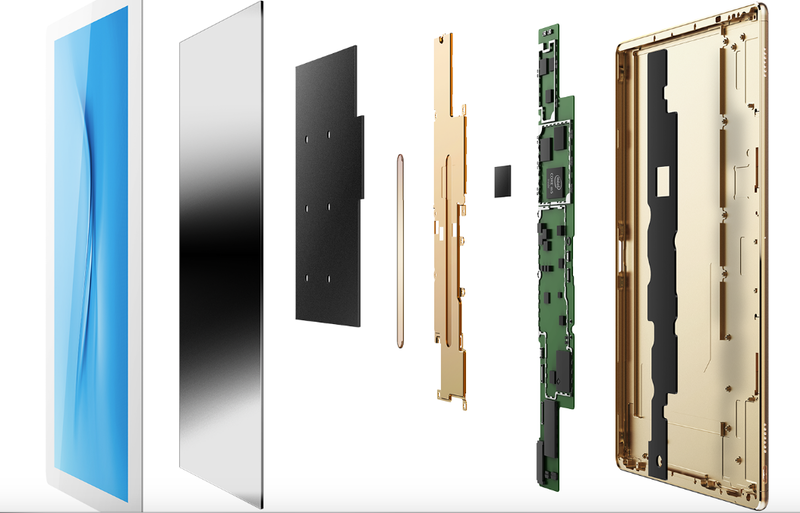 The result isn’t perfect, but once some key kinks are addressed, Huawei will add to its solid case as a top-tier hardware maker. The MateBook is a beautiful object. Really, Huawei’s taken great pains here to make the thing ooze class, right down to the Moleskine-like housing that encases the MateDock. The company’s employed a similar design language on the slate as with its handsets, moving to the unibody aluminum design as it has on its equally premium handsets. Of course, that makes for an extremely similar design language to other top tablet brands. Save for a couple of proprietary choices, there’s little that immediately distinguishes the hardware aesthetics from other flagship devices. But surely Huawei wouldn’t have it any other way. 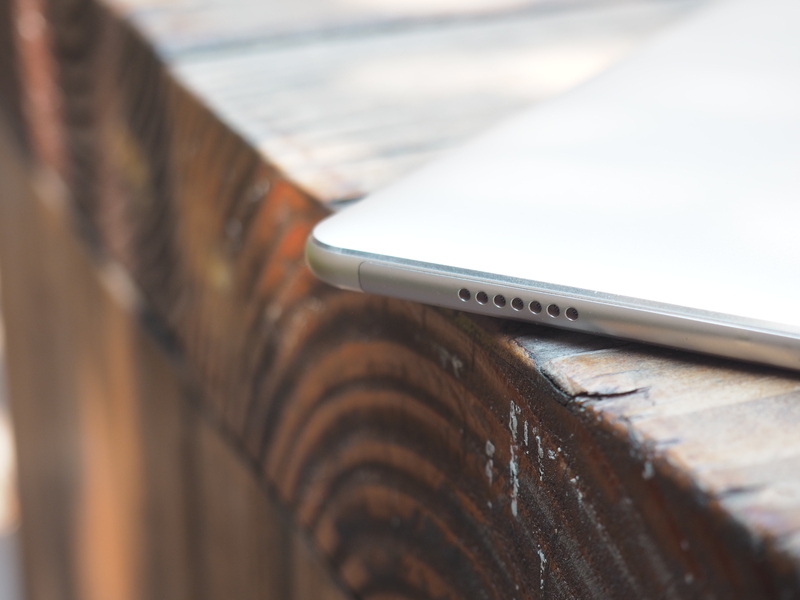 When you’re looking to establish yourself as a premium device maker, you can do a lot worse than drawing constant comparisons to the iPad Pro (not to mention the fact that my Apple computer is constantly trying to autocorrect the thing to “MacBook”). The front of the slate is nearly all screen. Huawei’s managed to shrink the bezel down to 12 percent of the total surface, which means the device comes in at 10.93 x 7.64 inches, making it fairly compact as far as 12-inch tablets go, particularly when coupled with the slim 0.27-inch profile (the same you’ll find on the iPad Pro). The company’s also managed to keep the weight down to a svelte 1.41 pounds. 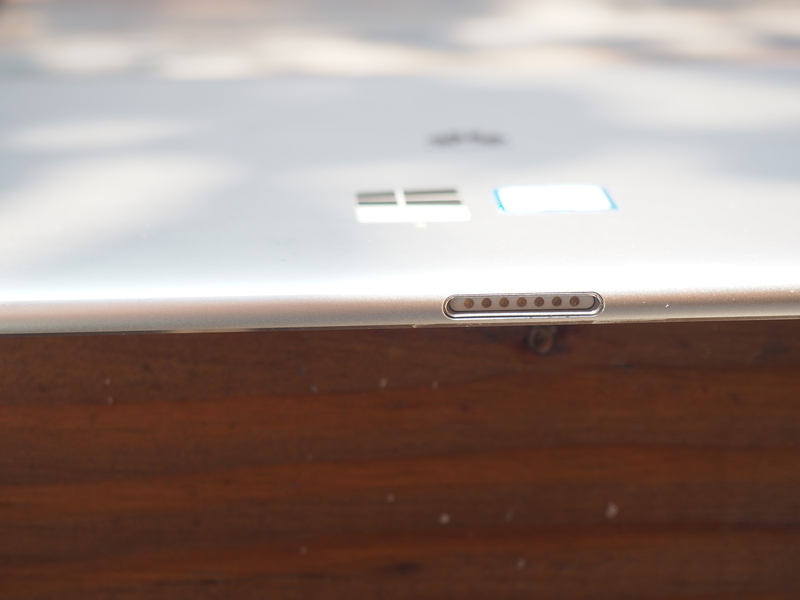 The back of the tablet is a lovely brushed aluminum and is, interestingly, completely devoid of a rear-facing camera. You just get the front-facing 5-megapixel one here. I did a bit of a double take there — making sure I wasn’t missing anything. At the end of the day though, are you really? I mean, do you want to be the dummy up front at the concert, shooting photos with your massive 12-inch tablet? 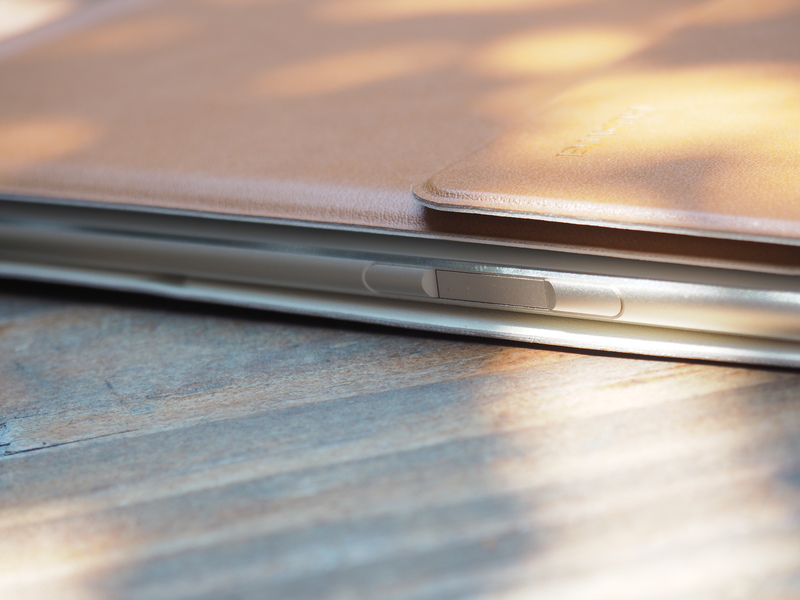 As for the sides, you’ve got two little speaker grilles and the power button up top, a USB-C port and sliver of a fingerprint reader with super-quick recognition flanked by the volume rocker on the right, and a seven-pin magnetic keyboard connector port down below, a clear nod to just how essential accessories are to the MateBook’s ecosystem. 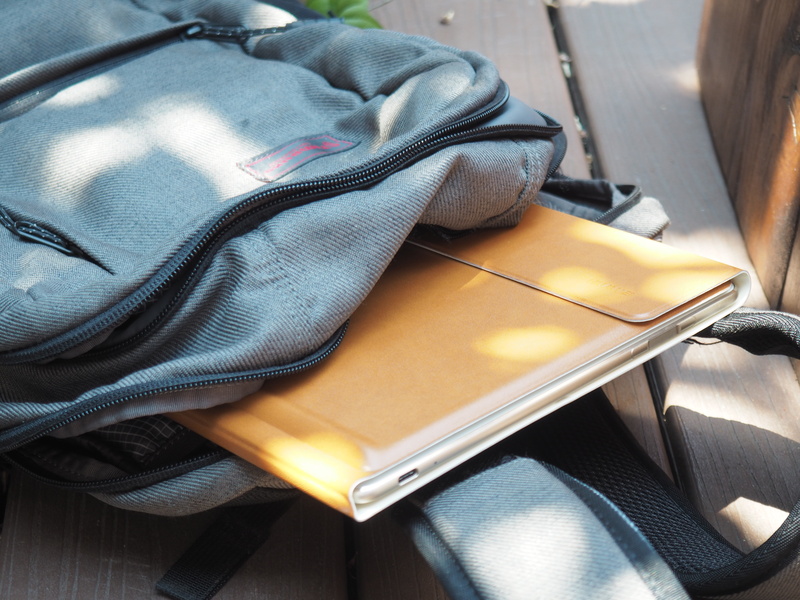 Like the Surface and iPad Pro before it, accessories are the key. Go look at Huawei’s product page. There’s a reason the company rarely pictures the tablet without at least one of the key three accessories. It’s the same reason I’ve opted to move the accessories section up to the top of the review, when we generally, at best, talk about such things in passing. The keyboard is, in a word, the key to the whole thing. At $129, it’s not exactly an impulse buy, but for most users, it’s almost certainly a necessity. 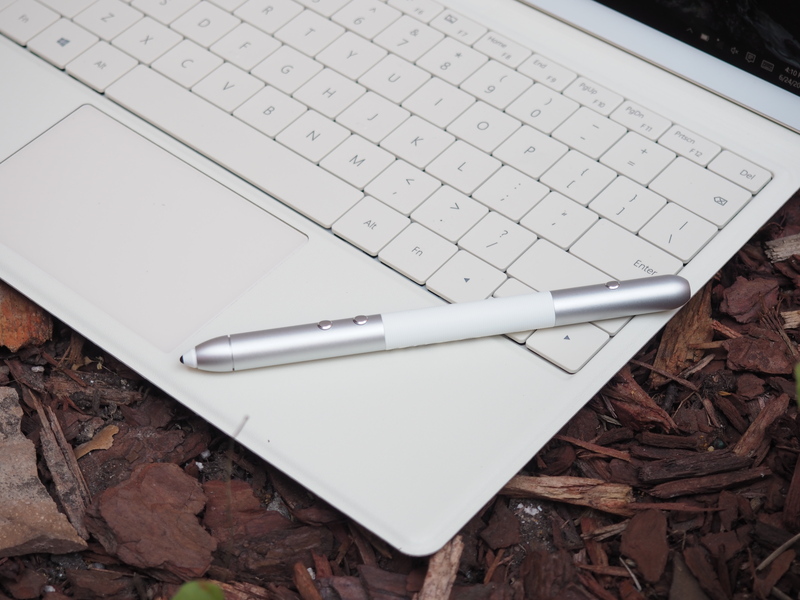 This, after all, is what makes the tablet a 2-in-1. The keyboard snaps onto the port with some seriously powerful magnets that make it tough to shake loose. 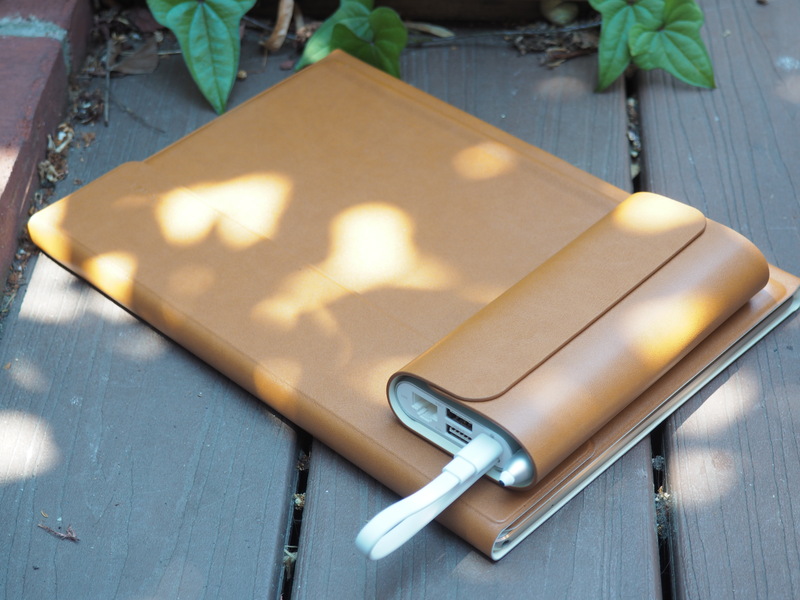 Additional magnets snap it tightly around the tablet, forming a faux leather folio that fits in nicely with all of the Banana Republic-style action shots the company has up on its page. The nice bit about the proprietary keyboard port is that the dock doesn’t require any Bluetooth syncing or the like. Plug it in and it works immediately. The keys have a good response. It beats a number of the keyboard cases out there, though they’re still not quite on par with that of a devoted laptop — among other things, you can feel the whole plane compress as you type. There’s also the issue of the kickstand itself, which can be finicky and has some trouble staying in place, should you want to go full-on laptop and use the in thing in, you know, your lap. The trackpad, on the other hand, is plenty good and responsive, on a level with most of the ones you’ll find on a notebook. The dock also boasts the bonus of being spill proof, something I wish I could say for long-dead laptops in my past. 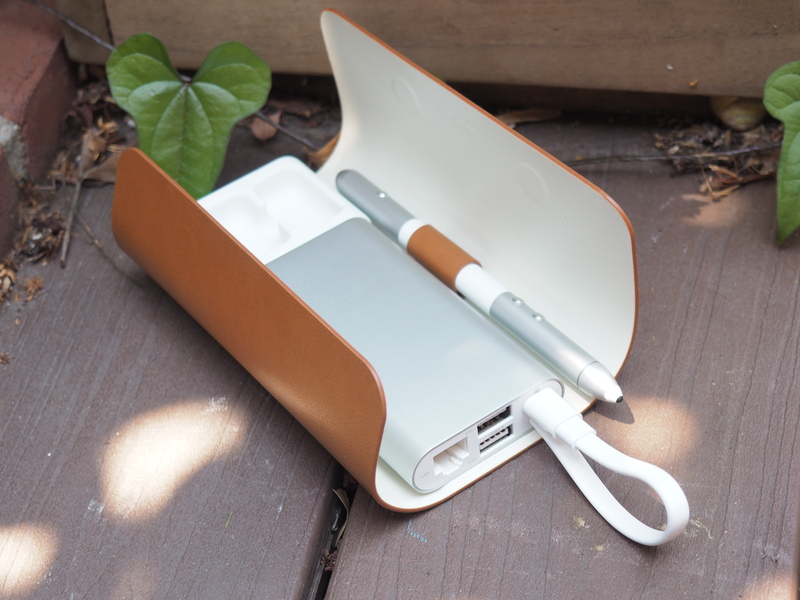 Another $89 will get you the nearly as essential MateDock. This, alas, is one of the ongoing issues with the move toward two-in-ones and slim notebooks in general. At the end of the day, there are just never enough ports. 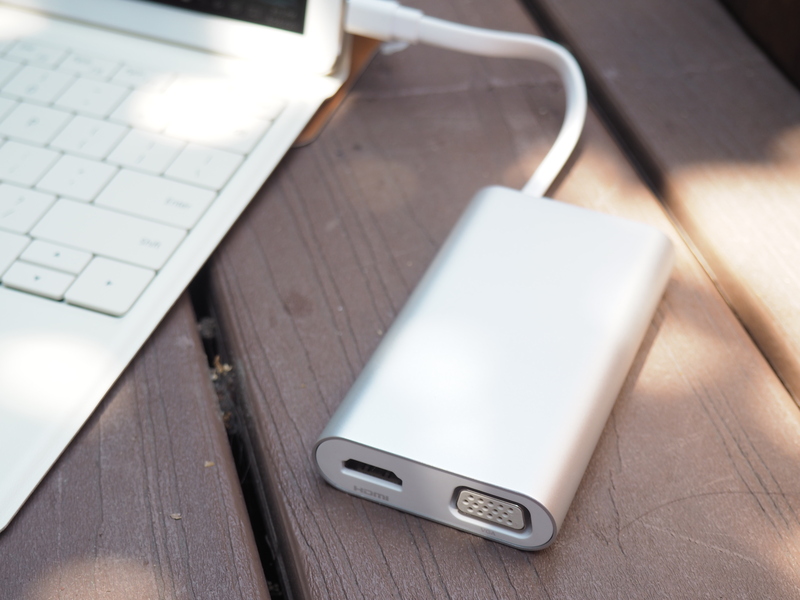 For most of us, that single USB-C just ain’t gonna do it. The dock brings HDMI, VGA, Ethernet and two additional USB ports to the proceedings. As with the keyboard, it’s a nice-looking accessory, but the hub isn’t exactly what one would call elegant. And it’s hard not to get the feeling that you’re losing a fair bit of that much-celebrated slimness with every additional add-on. Though there is a little spot inside for the stylus, so there’s that. The $59 MatePen is, undoubtedly, the least essential of the three accessories. I, for one, don’t really see a lot of real-world usage for myself, as I’m not really a tablet doodler and, thankfully, haven’t given a PowerPoint presentation in recent memory. If either of those apply to you, however, the stylus is a pretty solid investment. It’s a well-built piece of hardware, offering up 2,048 levels of pressure sensitivity, meaning that, as with a real pen, adjusting the weight applied will have a direct impact on the thickness of the line you draw. The pen has two buttons that let it double as a PowerPoint remote and a laser pointer built into one end, because why the heck not, right? Of course, you’re probably starting to catch on to how $699 becomes, well, a whole lot more. At 12-inches, the MateBook’s display is smaller than both the Surface Pro 4 (12.3) and iPad Pro (12.9). Its 2560 x 1440 resolution comes in at 216 PPI. Still, the screen looks great. The picture is crisp and the colors are bright without being oversaturated. Huawei puts the device’s viewing angle at 160 degrees — and it is, indeed, quite wide. The speakers, on the other hand, aren’t great. As with most tablets, they seem to be an afterthought here, and, quite frankly, you’d be better off taking advantage of that headphone jack or pairing the tablet to an external speaker. The sound on music playback is thin and tinny and not really recommended beyond a few minutes — though at least the company had the forethought to put them up top, so they don’t get muffled when the 2-in-1 is docked. That’s backed up by a range of Intel Skylake processors, ranging from M3 to M7. Our model was smack in the middle and did an admirable job taking what we threw at it. Again, there are certain things that a mobile device like the MateBook won’t be able to do as well as a full-fledge laptop, but when coupled with the crapware-free Windows 10 Signature Edition, you’ve got yourself an extremely capable machine. All of that’s rounded out by 4 or 8GB of RAM and up to 512GB of storage, which make it competitive with a number thin-and-lights. At $699, the MateBook starts $100 and $200 cheaper than the iPad Pro and Surface Pro 4, respectively. Granted, it’s a smaller machine, but it doesn’t feel any less premium, marrying the iPad’s good looks with Microsoft’s hybrid tablet/desktop software. It’s a really nice piece of machinery and a compelling choice for users looking to satisfy their tablet and laptop needs in one fell swoop. There’s still the usual functionality concerns of using a tablet as a daily driver, rather than a devoted notebook (including the need for a couple of flawed and not particularly cheap accessories), but Huawei’s taken a decent step toward creating a compelling two-in-one.